HSE 10 Person Economy First Aid Kit. Well organised kit for Light Industry. Offices. Small Building Yards. Travelling. 20 x Assorted Washproof Plasters Sterile. 4 x Triangular Bandage Non Woven. 6 x HSE 12x12 Premium Dressing. 2 x Premium No.16 Eye Pad with Bandage. 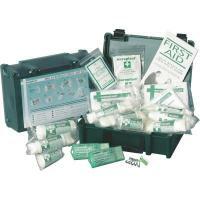 1 x HS3-Small First Aid Box.